Transform your business with MYOB Advanced Business. Transform your business with MYOB Advanced Business – a customisable, scalable enterprise resource planning (ERP) solution. Enprise implements and supports the MYOB Advanced Enterprise edition, which offers adaptable ERP for larger businesses for a convenient monthly price. We have extensive experience hosting, implementing, customising and supporting MYOB Advanced Business and MYOB Exo Business - get in touch to see what we can do for you. You could be using MYOB Advanced Business from as little as NZ$149 per month. * No matter what system you’re using now – Xero/Unleashed/MYOB Premier/Quickbooks, or any other software – Enprise can help you step up into fully-featured cloud ERP quickly and cost effectively. *Please note: NZ$149/month price applies to 1 user system; consulting services & training priced separately. Easy accounting and GL functions. Visit the Enprise Solutions MYOB Advanced Business YouTube channel for video demonstrations, tutorials and customer testimonials. MYOB Advanced Business is implemented and supported by fully trained and certified Enprise support consultants. A true cloud-based system designed to help businesses be more flexible by working online. 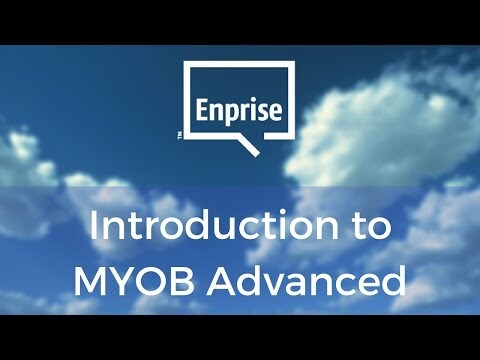 Enprise implements and supports the MYOB Advanced Business Enterprise Edition for businesses that need to manage multiple large-scale operations. Add new workflow, screens and modules with Advanced Studio. Putting your financial or other business software into the cloud is easy with Enprise. We offer different ways of getting you up and running in the cloud. Cloud the way you like it. Enprise offers three flavours of cloud. There’s one to suit your needs and budget. MYOB Exo Business in the cloud. Enprise can deliver MYOB Exo Business as a fully managed cloud solution via the Enprise Cloud.